Maple season has arrived ! Its been touch and go with huge temperature swings from 10˚- 60˚'s from week to week. Optimum sap running conditions seem to be when it dips below freezing in the evening and then rises above 32˚ during the day. This year being our second go round in the sap boiling game we figured we should double our buckets and move from around six last year to a dozen this year. Tapping trees isn't something to be overly hesitant with. A decent drill and a proper sized drillbit depending on the size of your spile. 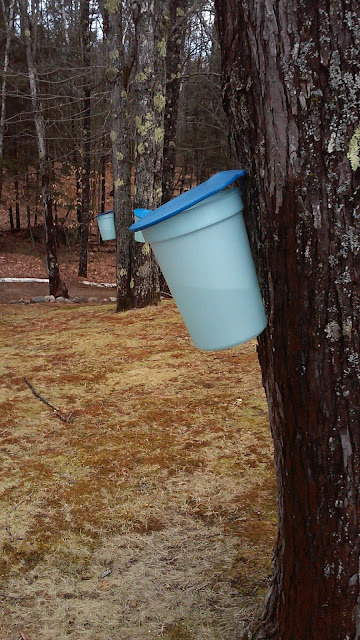 The spile is maple jargon for the spout the sap drips out of and a simple bucket with a lid are all you need to get started. Big commercial operations use drip tubing to collect the sap into large 50 gallon drums... when you get that large then your in the business and you need to source a large scale evaporator and then your hobby turns into your career. We just like to boil enough to supply the homestead and allow us to gift some to our closest friends and family as well as to barter for unique goods. We boil on a cast iron grate that we lay two steam trays across which I acquired at a local restaurant supply store last year. Each tray holds about 2.5 gallons comfortably so I usually get the boil rolling with a 5 gallon bucket separated into the two trays. The art of getting the fire burning hot enough is a long arduous task that I am still finding the knack for. It has lots to do with the size of the wood your burning, the moisture content, wind conditions etc. Every boil presents itself with different challenges but essentially I'm just sipping a fine beverage and keeping tabs while completing other small tasks around the homestead, always coming back to check on the fire every so often... probably more than I should most times. As the boil progresses I usually find one pan gets roaring and the other just simmers... when this is the case I position the logs as such and will use a small kitchen pot to transfer sap from the simmer pan into the boil pan and then replace the simmer with some fresh sap to help keep the aggressive boil going. Usually by the two hour mark or so I've developed a hot enough bed of coals that both pans will be evaporating vigorously and Ill just add a couple quarts of fresh sap drippings every hour or so. The most sap I've boiled with this method so far was close to 55 gallons in a weekend. That took from 5:30am on Saturday till about 11:30pm, then I started another boil at noontime on Sunday and boiled till 8pm. So it can be a lot of work but again if your gonna be around the yard getting some projects done it works out to be a fulfilling weekend project with delicious results. Some of the essential tools of sap season ! Lots of extra 5 gallon buckets and I found the water container we paid a deposit on while we were having our water treatment system worked on last spring works great with my brewing funnel for collecting sap. I usually line the funnel with some cheesecloth to filter out the couple insects and pieces of bark that will occasionally be found floating in the collection buckets. Here you can also see our crappy kitchen pan that was destined for the goodwill pile which has actually proven quite useful for transferring sap during the boiling process. The other must have for any homesteader especially one who enjoys spring projects in Maine during what most of us call mud season, is a watertight pair of muck boots ! I picked these Lacrosse brand boots up last year at LL Bean and they have paid off the cost already and will be essential when we trod forward into raising livestock at the homestead as well. 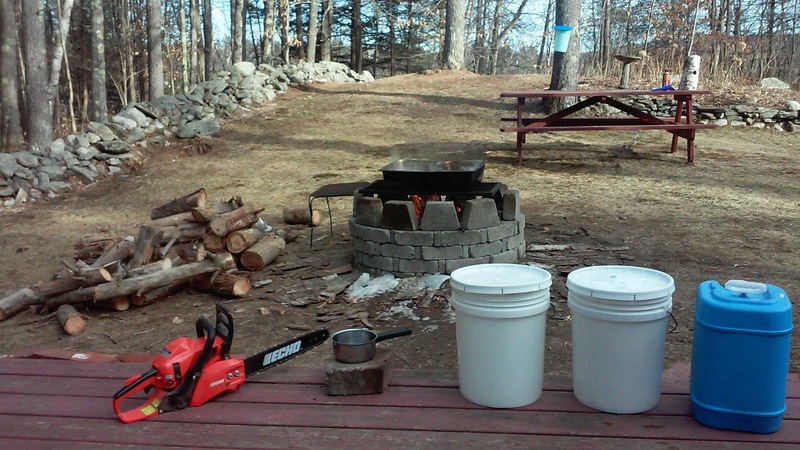 The other key resource for boiling maple sap is fuel. We were lucky enough to find an old abandoned wood pile that had lots of mossy, fungus growth all over it and had two options, let it rot or burn it. We obviously did not want to bring this grade of wood into our dwelling as it would have not been a great source of heat and was harboring quite an eclectic array of insects. Instead we chose it as a good source for our outdoor firepit ! It got us through last years maple season, summer bonfires and now we have finally gotten down to the last bits left frozen into the leaf litter it was stacked on. The end of crappy wood pile got me busy making use of the abundance of blown down trees and also a good way to get acquainted with the use of a chainsaw. The nice dry lumber from the trees that were hung up on some others made for a very hot boil this time around and I am excited to clear more space so the woods will not be filled with so many fallen hazards. An average week during sap season we gather 20-40 gallons with the current 12 bucket set up. Typical ratio's for boiling are 40 gallons of sap to one gallon of syrup. The buckets get emptied first thing in the morning before work, and sometimes again in the evening. Sap is best when kept cold, sap season temps help with this situation by dipping low enough for the 5 gallon buckets to actually freeze, or at least be cool enough to stay fresh for 3-5 days. Last year there was plenty of snow pack and that makes things easy. You can simply bury the buckets in a snow bank till boil day arrives. This year winter in general has been much warmer and Im spending an early spring clearing out some brambles and making headway on the herb garden expansion. Last year I was carving benches out of snow for boil days. A view of a good yielding bucket. The warmer temps also give way to mud, which makes for pushing wheelbarrows full of firewood up a hill a bit more of a project then the first few loads early in the morning when the ground was frozen solid. Lessons learned... but even though my big foot made a mess, I didn't drop the load or get a face full of mud which is really the success story here. As the sun sets and night falls, I give the syrup a good strain through cheese cloth and a fine meshed nylon bag into our 4 gallon stock pot and finish off the process on our cookstove. This allows a closer observation during the final hours of the boil. I routinely check consistency and mouthfeel with a spoon and as it gets closer dial in the final sugar content with a syrup hydrometer. From there I usually will fridge the final batch overnight to allow any sediment to settle, then strain again in the morning with multiple layers of mesh. The final amber glow and smokey sweet maple flavor makes the whole process worth it. 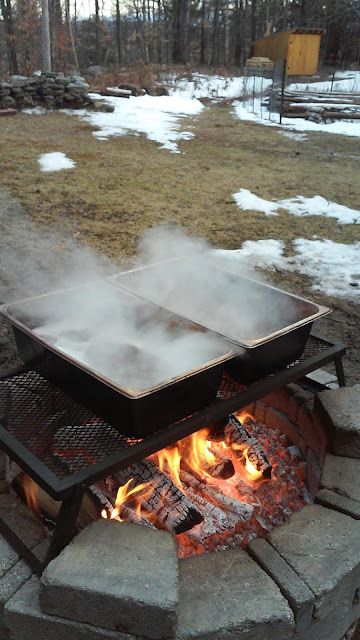 Stay tuned for part two of maple season coming this weekend. It will be a "how to" on our most recent batch of ferments, Maple Wine. We have also recently bottled our Dandelion Wine and Blackberry Cider. Labels are coming along an I will share the results as they start to get opened. Thats all for now, Thanks for stopping by.